About Us | Transparent Glass Coatings, Inc.
Transparent Glass Coatings has been locally owned and operated since 1975. Transparent Glass Coatings combines years of experience with professional service and the highest quality products to insure that your Auto, Home or Business gets the premiere workmanship it needs from the very best in this business. We are Your Window tinting Pros. Are you interested in our services? Learn more about our services here. Please contact us by phone or email to get a free estimate for your project. After presenting the free estimate we will discuss the project in full detail. 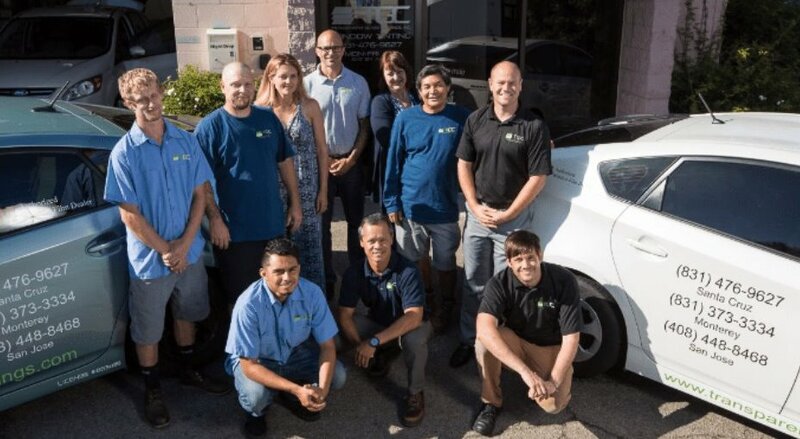 Our team is here to help you at any time! TGC's Core Purpose Statement hangs on the wall of every office: "To enhance life experiences by operating with the highest standards of quality and integrity, while also applying successful teamwork to create opportunities for growth and more enjoyable relationships." Casey is recognized as the premier auto- tinter in our area. He is meticulous, a perfectionist, and takes great pride in his work. When he is not busy installing film, Casey is out surfing with his wife, tinkering with his PC, or listening to podcasts. Mollie is originally from Upstate New York. She loves living in the Santa Cruz area mainly because it does not snow! Mollie enjoys running and participating in triathlons. It is Mollie’s belief that great customer service is the foundation of a great business relationship. Thom is the guy who is in charge of TGC’s installation teams. He is proud to say that one of his crews can be found in someone's home or business anywhere from San Francisco to beautiful Big Sur any day of the week. In his spare time Thomas enjoys fishing and gardening. Ryan is a Santa Cruz native and has been an employee of TGC for 17 years. He started as an installer, was the Installation Manager for ten years and is now our Sales Executive. In his free time, Ryan can be found mountain biking all over the Santa Cruz area with his friends and family including his two young children. Joe is one of the latest additions to the TGC team bringing with him a high level of Customer Service and Sales Experience. Growing up in the Hospitality Industry on the islands of Guam and Hawaii has helped Joe to keep the aloha spirit alive and is seen in his enthusiasm for his work. You may see him out on the water surfing, or underwater spear fishing any time that he is not working! Drew has been in the window tinting industry since 1996, and there is not much he does not know about installing film! He is a local boy; Santa Cruz born and raised. Drew is an avid disc golfer and enjoys being outdoors. Cameron loves the outdoors and he cannot get enough of anything related to motorsports. He is a local boy and Bay Area sports fan. Cameron is currently pursuing a certificate in Construction and Energy Management at Cabrillo.